Gelati Monastery is the distinctive expression of the flowering of feudal monarchy in medieval Georgia. 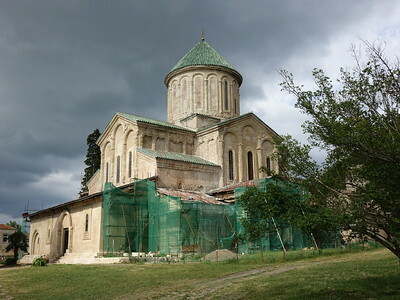 The Gelati Monastery (near Kutaisi) was founded in 1106. It remained for a long time one of the main cultural and enlightening centers in old Georgia. It had an Academy which employed the most celebrated Georgian scientists, theologians and philosophers. The Gelati Monastery has preserved a great number of murals and manuscripts dating back to the 12th-17th centuries. Since the retreat of the controversial Bagrati Cathedral, Gelati Monastery can shine in its own right. And what a sight this is. Its wall paintings are overwhelming and intriguing at the same time, because the depicted people far exceed the average list of Christian holy figures. They show saints and historical figures from Georgia and the Byzantine empire in their most beautiful clothing. The 12th century Gelati Monastery dates back to the Golden Age of medieval Georgia. The complex consists of 3 churches, a free-standing bell tower and an academy building. It was for a long time the cultural center of Georgia, with its own academy where the best scientists, theologians and philosophers worked. From the center of Kutaisi a minibus leaves 5 times a day directly to this monastery. It starts from a small parking lot with some other local minibuses at the back of Meskhishvili Theatre. The ride costs 1 lari (0.30 EUR). The 4pm bus that I took only transported women: a few living along the route who had gone shopping in the city, another tourist and me. We two were the only ones that remained on the bus til the end. You can already see the monastery from a distance, on a hill amongst the greenery. The drive takes only a short 20 minutes. The complex has the (for Georgia) usual set of souvenir and snack stalls in the parking lot. A small courtyard contains the 3 churches, the bell tower and the academy building. I immediately went for the main church. Its interior is covered with murals over the entire surface. There are innumerable scenes and portraits, clearly made in different periods. I was happy that I brought my Bradt travel guide with me: in its 2 page description of the Monastery the names of the most prominent persons depicted are given. Above the altar in the dome there is a golden mosaic of Mary with Child - a Byzantine-inspired mosaic that is unique in Georgia. There is more to see at the corners of the courtyard. At the south gate for example, which contains the tomb of David 'the Builder' - the 12th century king who founded this monastery and many other important buildings in the Golden Age of Georgia. Everyone who left the monastery had to walk over his grave. The remains of an 11th century iron door from Persia are still hanging in the gate, once taken back to Georgia by David's son as war booty. Of the 2 smaller churches the St. George is the most beautiful. Just like with the big church they are restoring its exterior and it is partly covered in scaffoldings. You can not enter it (it is reportedly only open at weekends and is often used for marriage ceremonies). But the doors leave an opening through which you can see the inside: this is perhaps an even bigger wall painting than the main church. A lot of bright red and blue has been used. The minibus schedule allows one to have 1 hour at the Monastery, which is really too little. I spent about 1.5 hours there and waited for the last bus of the day (6.20 pm) to bring me back to Kutaisi. Distance wise this is walkable as well as it is 8km, but there are one or two nasty climbs en route. Our group from Switzerland visited both places this September. We were happy to see that Bagrati Cathedral shows no more outward signs of damage. We were even spontaneously given a little concert of Georgian songs by four men in traditional costumes. As for Gelati Monastery, it was a great joy that the academy building was completely restored, including a solid roof. So it was easy to picture the academic life of those times. We've visited Bagrati Cathedral yesterday. The restoration process is coming full force, transforming the building. During my last visit, the church had no roof. Now, the roof is done and building is almost reconstructed. I really enjoyed the "original" no roof look. Now, it looks just like any other church in the area. The “double headed” WHS of “Bagrati Cathedral and Gelati Monastery” consists of a ruined (in 1691 by the Turks) Cathedral of the 10th to 11th centuries in the town of Kutaisi and a (still functioning) monastery complex built between the 12th to 17 centuries situated in the countryside some 12kms away. Apart from the geographical proximity and the fact that, taken together, the 2 buildings represent a long and continuous period of Georgian religious architecture, I know of no reason why they are linked together in a single WHS. Even in “shell” form the cathedral is an enormous building. It is named after Bagrat III the first king of united Georgia and is no doubt of considerable architectural interest. I also understand the comments made by another reviewer about the open roof not necessarily detracting from its religious impact (UNESCO has severely criticised the idea, apparently floated in the early 90’s, presumably as some sort of “Georgian independence celebration”, of rebuilding the Cathedral!). I however did not find the building and its setting particularly inspiring. Bagrati Cathedral was a beautiful experience. Our church plans a mission trip every year to the Republic of Georgia to help out orphanges and we always visit Bagrati Cathedral because it is such a beautiful place. We do not have anything like this in the USA. I was so impressed with the architecture and at night our group went up there at sunset and we took candles because there is no electricity. What an awsome experience. We met many native Georgians that night and made many new friends. This will be a place we will always return to because of the many wonderful memories there. I found this quote that I thought was very fitting to Bagrati. 4.0: Stanislaw Warwas Tony H.
After excluding Bagrati Cathedral, which has undergone major reconstruction detrimental to its integrity and authenticity. Inscribed element(s) removed: Was originally inscribed in 1994 as "Bagrati Cathedral and Gelati Monastery". Reconstruction of Bagrati led to its removal in 2017 as a "Major Boundary Modification" together with a justification of Gelati on its own.